Kyphosis is a disorder in which an excessive outward curvature of the spine results in an abnormal rounding of the upper back. Kyphosis generally tends to get worse with age, and once the angle progresses past 40°, it's referred to as hyperkyphosis. Up to 40% of adults over the age of 65 have hyperkyphosis, and those with severe cases are at an increased risk for falls and fractures. Many older adults with hyperkyphosis suffer from poor and worsening quality of life and physical function due to their condition, and it's therefore important to develop strategies to address their disorder. Previous research has shown that strengthening exercises for the back muscles can lead to improvements in patients with hyperkyphosis, but most of the included studies on the topic suffered from limitations of some sort. For this reason, a powerful study called a randomized-controlled trial (RCT) was conducted to evaluate if strengthening exercises were, in fact, effective for patients with hyperkyphosis. In the research world, RCTs are considered the gold standard for determining the benefits of a particular treatment. Individuals over the age of 60 diagnosed with hyperkyphosis were invited to participate in the study and screened by the team of researchers. In order to be accepted to the RCT, they had to be able to walk one block without an assistive device, climb one flight of stairs and rise from a chair without the use of their arms. From a pool of 598 individuals, 99 were deemed eligible and then randomly assigned to one of two groups. Half the participants were placed in the treatment group, which consisted of three hour-long weekly exercise sessions every week for six months. These sessions were led by a physical therapist and included various exercises that targeted muscle impairments that were known to be associated with hyperkyphosis. In particular, the exercises focused on strengthening and improving the flexibility of certain back muscles, and participants were also given the training to help improve their posture. The other half of participants were placed in the control group, which attended an education session every month for four months. All patients were assessed at the start of the study and then six months later for the curvature of the spine and several other outcomes. 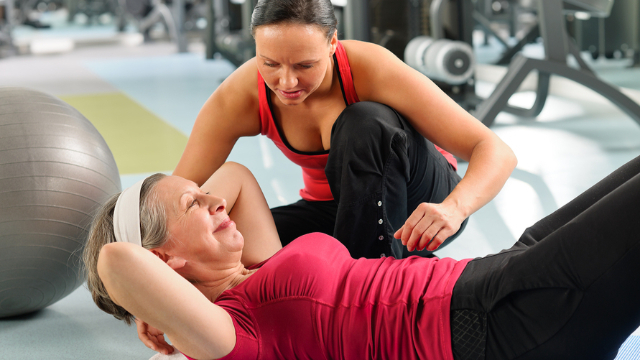 Results showed that patients who followed the physical therapist-led exercise program experienced several significant improvements when compared to the control group. Most importantly, the angle of the curvature of the spine reduced by an average of 3.3° in the treatment group, compared to only 0.3° in the control group. In addition, the treatment group reported better self-image and satisfaction with their appearance after completing their treatment. The findings of this RCT suggest that a treatment program that consists of strengthening exercises for the spine and posture training can lead to physical improvements in patients with hyperkyphosis, which appears to boost their confidence in turn. Individuals with hyperkyphosis interested in improving should, therefore, think about seeking out the services of a physical therapist to address their condition. Copyright 2019 Penn Therapy Associates , All Rights Reserved. Powered by E-Rehab.